The beach is included in a protected area in the mouth of the Barayo river, which divides it into two parts. The dunes behind the beach harbour an incredibly diversity of life, including otters that may sometimes be spotted on the beach. And behind the dunes there is a forest you have to cross in the way down from the top of the cliffs. 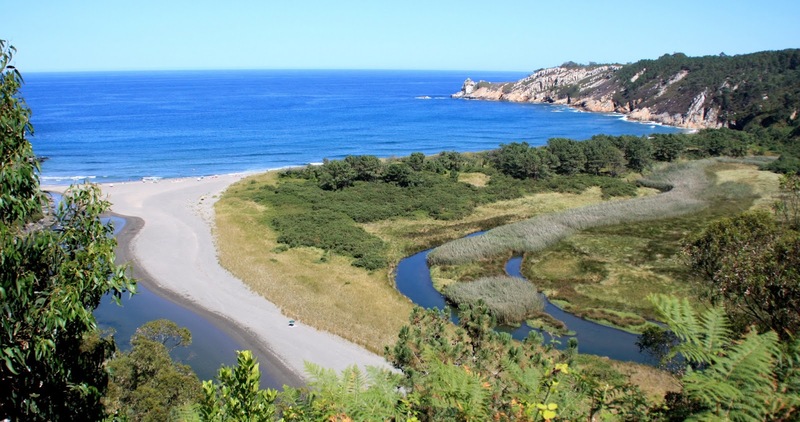 Since it is included in a protected area, you can not get by car to the beach. However, there are two parking areas on top of the cliffs, next to paths that take to the beach. The first one is in Vigo, a little town near Puerto de Vega. When you reach the first houses, take the road on your right when you see the sign indicating Barayo beach. 300 m later you arrive to the parking area. Then you have two (three) options. The first one is to use the path that goes along the cliff border and walk about 400 m with the beach on your right until you see the stairs that go down to the sea. More than 100 irregular steps, but not too complicated. Then you are on the opposite shore of river Barayo, which you have to wade to get to the beach. Depending on tides water can reach your ankle... or much higher. Next option is to follow the unpaved road on the right side of the parking area. You walk downhill for 300 m until you see the stairs on your left that take you to a narrow path between the trees and then to a bridge. Unfortunately, the river may have changed and even destroy it. In 2018 the river has moved slightly towards the beach and the bridge has dissapeared. I don't know if it is possible to wade the river there, but at low tide you can walk through the shore to the base of the stairs and cross it there. Alternatively, you can stay on the road past until it reaches the lower part of the valley. Then you have to cross the forest through a narrow path that ends in the road coming from the second parking area. The problem is that sometimes the area is full of mud and walking can be difficult. The other parking area is in the opposite side of the valley. You get there through a narrow road that starts on the right of N-634 road, not far from Otur. From there you only need to walk a wide path that takes you to the right end of the beach crossing over the dunes. It is spectacular. More than 1km of fine grey sand, putting together the sections facing the sea and the river. The last one is wider and protected from the wind, but the sand is full of pieces of wood and debris dragged by the river. The other section is longer but narrower at high tide. At low tide, however, the sea withdraws leaving a huge flat area. To the east, the beach finishes under high cliffs where you can find a cave flooded by the sea at high tide. It can be visited to enjoy the shadow and check the contrast between the sunny beach and the dark cave. Only in the villages nearby, but nothing on the beach itself. The main nudist area is the east end, next to the caves. The bend in the river mouth, on the other hand, is the textile area. The center of the beach and the river shore are mixed zones, depending on the season. While in the summer you will hardly see any nudist there (only early in the morning or very late in the afternoon), the rest of the year it is possible to sunbathe or swim naked everywhere in the beach.